Click the image to download and edit this spreadsheet. One of the main events in a divorce is the splitting of assets. First you need to determine how much income and expenses both spouses have on a monthly basis. Then you can identify how assets can be distributed. The court also uses this to determine whether one spouse should pay spousal support or child support, or whether one spouse needs financial support. To complete this process, most spouses engaged in a divorce, complete a spreadsheet and submit it to the court. This article contains a sample monthly finance spreadsheet that can be used in a divorce. It is intended to be a sample and not as a substitute for obtaining legal advice regarding reporting income and expenses in a divorce from a licensed attorney. To access this document, click on the image attached to this article. The spreadsheet is compatible with MS Excel, Libre Office, and Open Office. The spreadsheet can be completed by either party to a divorce. It contains columns for pre-divorce income and expenses, and estimated post-divorce income and expenses. This helps the court identify one party's need or ability to pay as it will exist in the future. The document can be completed at different times during divorce proceedings, depending on whether the spouse's financial circumstances have changed. For this purpose, a line in which the spouse can insert a date appears at the top of the spreadsheet. The spreadsheet's entries have been formatted to translate all numerical entries into dollar amounts. The spreadsheet also contains formulas to help you calculate the totals of your income and expenses. Formulas for expenses have been provided for each category as well as overall. If an entry on the spreadsheet does not apply to you insert a "0," but do not delete the line so that the formulas remain intact and operable. The last line of the spreadsheet automatically calculates the total amount of money you have in your bank account each month by subtracting your expenses from income. This shows your overall need or ability to pay. The spreadsheet is designed for monthly income and expenses. For this reason, if you pay an expense on a yearly basis, divide the total amount of that expense by 12 to obtain its monthly amount. If you pay an expense twice or more a month, add together the total amount of payments you make for that expense in a month to obtain its monthly amount. These same rules apply to income. For example, if you are paid twice a month, add together the total amount you earn to obtain your monthly salary. As another example, if you receive dividend income once a year, estimate how much you typically receive using previous years' records and dividing that amount by 12. The first part of this spreadsheet details the spouse's income. Income can be derived from multiple sources, including spousal or child support already being received due to a temporary court order, salary from work or dividends from investments. The spreadsheet contains entry lines in which you can add income derived from other sources not already listed. These numbers are listed in black to indicate money entering your bank account each month. In this section, provide all income brought in a monthly basis. The amounts provided should be post-tax. For salary, post-tax dollar amounts are detailed on a paystub. For dividend and other income, you will need to check the tax bracket applicable to the type of income. Then calculate the amount of tax you owe on that amount, per year, and subtract that percentage. Then, divide the total amount of income you receive from the source by 12 to obtain the monthly post-tax amount you earn each month. This helps reflect the actual amount of money a spouse has each month. Additionally, most courts will not calculate this amount for you, so it is necessary that you do it prior to submitting your spreadsheet, to show your actual income. On the spreadsheet, expenses are divided into multiple categories. Each category contains the basic elements that courts normally consider. These numbers are in red to indicate that they are money flowing out of your bank account each month. However, each category also contains available space in which you can list the type and amount of expense that you believe should be included on the spreadsheet based on your circumstances. Note that the medical expense section includes those costs affiliated with medical care for a child as well as the spouse. This is because medical expenses for children are often difficult to divide from a spouse's. For example, it is nearly impossible to determine how much of a premium payment goes towards coverage for a child on an insurance policy. Therefore, including child medical expenses in the medical expenses column is done for simplicity's sake. This is separate from 'child care' expenses, which cover child care that a spouse needs in order to work. Courts do not look favorably upon inflated expense or deflated income reporting. Be honest about what you actually earn and spend each month so that the court knows what you need or can provide the other spouse or your children. Being dishonest leads the court to not trust you during future proceedings. It should be noted that many courts require that spouses provide receipts, pay stubs, or other paperwork demonstrating and supporting the numbers they report. Therefore, keep together any documents you use to complete this spreadsheet, so you can supply them to the judge. 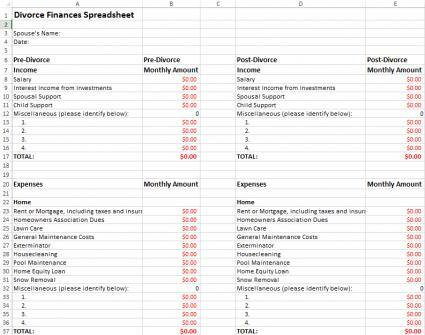 If you need to detail your income and expenses, it's time for you to create a spreadsheet. The spreadsheet provided in this article can help you easily calculate your monthly cash flow. Again, this spreadsheet should not be used as a substitute for legal advice. Always consult with an attorney prior to completing or submitting any document pertaining to finances during a divorce proceeding.